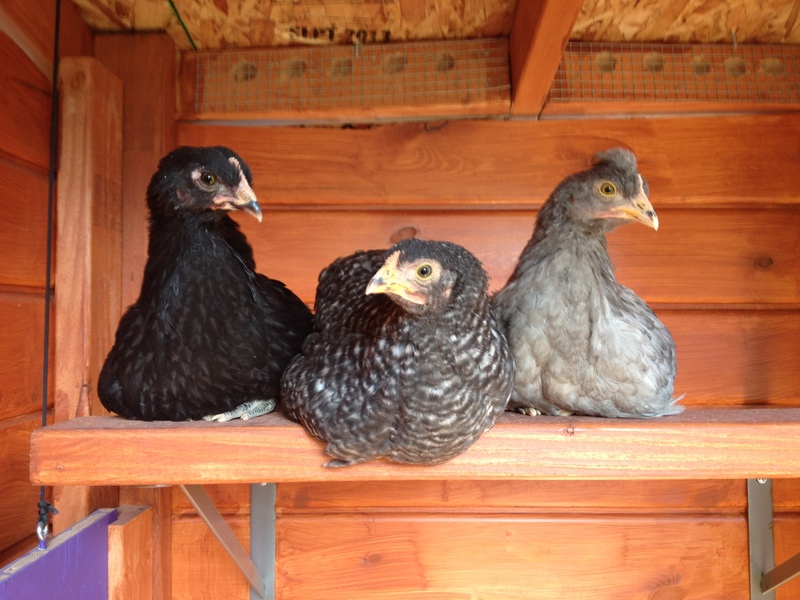 Loretta, Nellie and Gigi hang out on the high roost for an afternoon rest. Today was a busy day on our urban homestead. While Matt was away running an errand, I got to thinking about poop. Specifically a better way to clean it up. First I want to report that my Stand-n-Scoop arrived in the mail, and I absolutely love it. 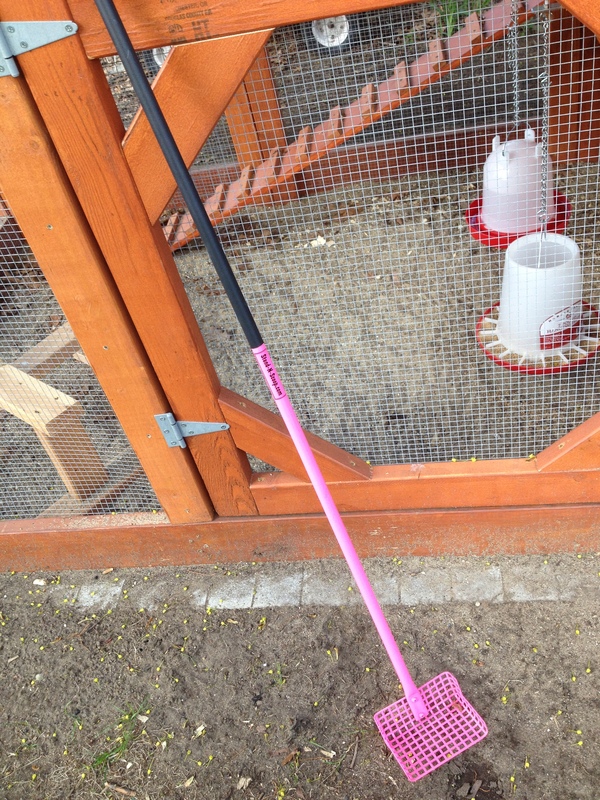 I’m able to pick up poop in the coop, and reach under the hen house, which was a real problem for me before. I think the size works well for my coop, but a larger scoop would be awesome for anyone with a run area larger than mine. I found it works best for poop that I can see sitting on top of the sand. I can scoop it up and sift all in one motion. But what about the little stinkers that are buried in the sand? After constructing the sifter, I added handles. I had an idea based on a photo I saw in a blog: A large-scale hand-held sand sifter. 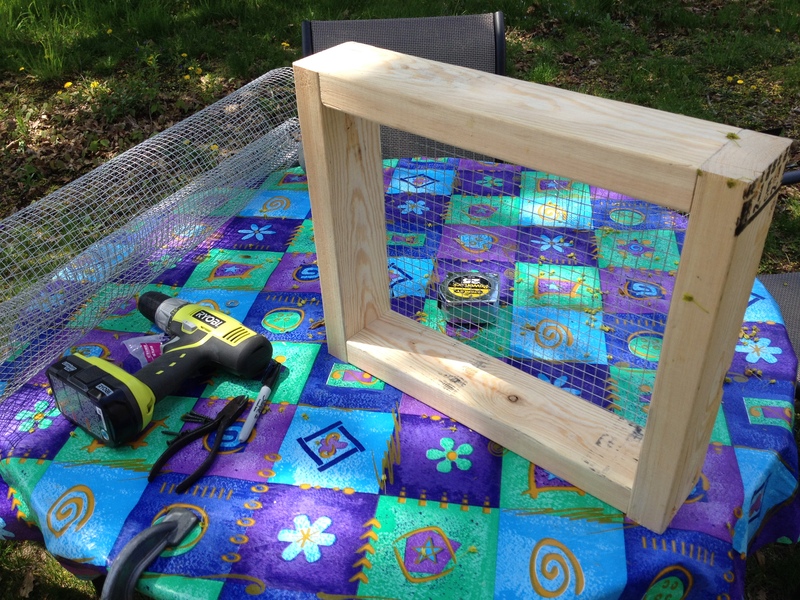 I used the miter saw to make a few cuts, and screwed together a frame of 2x4s. Then I trimmed a piece of wire mesh, and added that over the bottom side using screws and washers to keep everything in place. I ran down to ACE Hardware (thankfully only a few houses away) and bought handles. So this works for bigger poop collecting. I’ll put it down on the ground and use a shovel to scoop sand into the sifter. Then I lift and sift, leaving the little nuggets in the frame. I’ll be able to cover a lot of territory with this, and go below the surface. Awesome! Eventually, Nellie popped out and pecked at the ground. Matt carried Loretta about 15 feet from the coop then put her down. Check out the video to see what happens next. I’m glad to see the chicks all consider the coop their “safe place.” I know they will soon grow braver, and explore the yard. There’s no rush. Look what Matt found in our yard! While Matt was mowing, I heard him frantically scream my name. I dragged my feet, expecting to find a mangled bunny carcass under the mower. “C’mon! Get over here!” he yelled, pointing to the ground. This was our take from the side of the house! I warily walked up, then looked at his feet. I couldn’t believe what I saw. A clump of very mature white morel mushrooms. Just that morning we had lamented about how we would miss morel hunting season this year because we do not yet have a chicken sitter. I dropped to my knees, and crawled through the dirt, checking under clumps of tall grass. 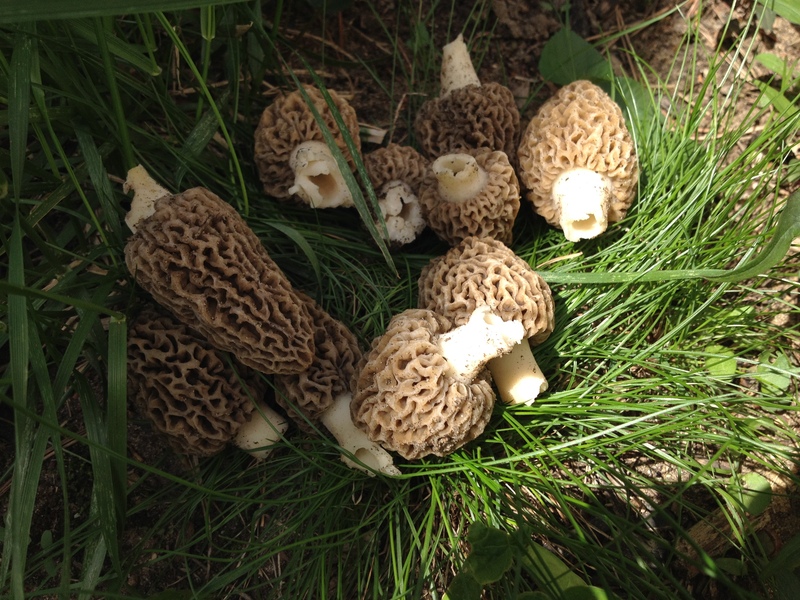 In all, we found 10 morels! I wondered if this was something new, or if they had grown for years in this tucked-away spot on the west side of my house. I have no idea. But I’ll be checking for more in the morning! They look so regal sitting up there! Don’t they? And that is the official pecking order on the roost. They now sit in that order! 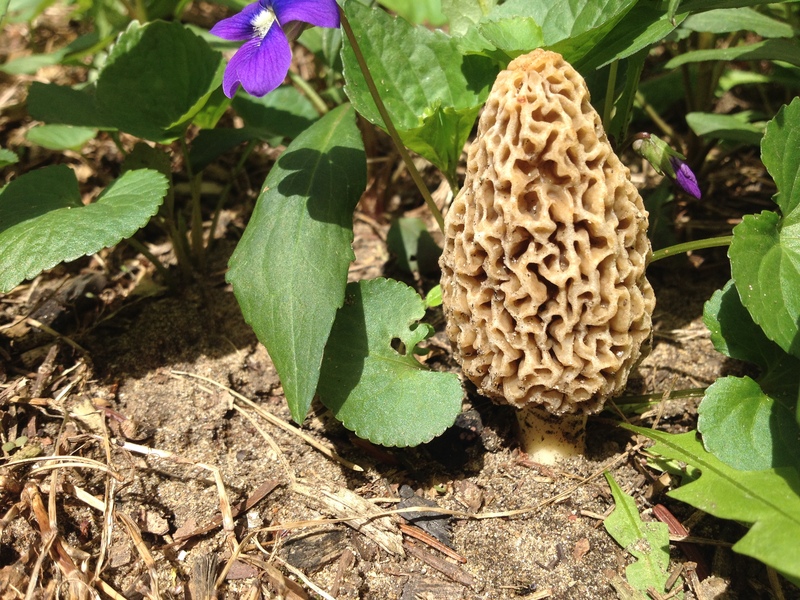 BTW, did you know that in Kentucky they call morel mushrooms, “Hickory Chickens”! How ironic, huh! Lol! That’s hilarious! And they were yummy tonight!